Incoming Bruin big man, Drew Gordon scored 15 and grabbed 7 rebounds to help lead the USA Select basketball team to a 98-78 victory over the World Select team at the 11th Annual Nike Hoop Summit held at the Rose Garden in Portland. Gordon demonstrated the type of athleticism and hustle he will bring to Westwood next season. Gordon added four blocks and seemingly was always around the action in his 18 minutes of play. The USA roster included four players who are committed to play at UCLA next fall. The group included Gordon and guards Jrue Holiday, Malcolm Lee, and Jerime Anderson. Three of the Bruins, Gordon, Holiday, and Lee were in USA's starting line-up. The World team managed to stay close for more than a half, thanks largely to an inside presence that featured 7'1 Alexis Ajinca of France and 7'4 Boban Marjanovic of Serbia. They helped to force the Americans to alter a number off inside shots and USA led only 43-42 early in the third quarter. But the USA team had a quicker group of perimeter players, led by Holiday, Lee, and Anderson, and the Americans used it to their advantage by forcing the internationals into 10 third-quarter turnovers. That defensive play sparked an 11-0 run that gave USA a 54-42 lead with 6:10 left in the third. Holiday led the spurt with a three-pointer and an ally-oop dunk on a lob pass from Tyreke Evans. "Our big men weren't quite as big as the other team," Drew Gordon said. "We battled hard in the post but the guards definitely stepped it up on offense and on defense to stop their pressure and set up our offense." "I think our defense was the key to pulling away in the second half, especially our guards," Jrue Holiday said. "We picked up full-court, and applied a lot of pressure up top, trying to distract them and disrupt them." Holiday finished with 11 points although he missed a number of lay-up opportunities in the first half. Teammate Malcolm Lee scored 3 points in 12 minutes action but his playing time was somewhat limited due to early foul trouble. Although Jerime Anderson came off the bench for Team USA, he was clearly the best floor general in the game. The offense flowed better when he was at the point, in addition, his defense on the World team guards was stellar. Anderson finished with 4 points, 3 assists, and 3 steals in 15 minutes of action. "When we play for the USA, it's all about the team," Andreson said. "It's all about playing and trying to get the win. Nobody is trying to get theirs; we're playing as a team. I felt that we did that really well today." 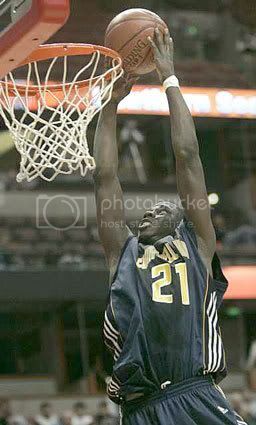 All four members of UCLA's top-ranked 2008 men's basketball recruiting class are scheduled to participate in Saturday's 2008 Nike Hoop Summit in Portland at the Rose Garden. Incoming Bruin freshmen Jerime Anderson, Drew Gordon, Jrue Holiday, and Malcolm Lee are all scheduled to play for the USA Select team against the World Select team. The game is scheduled to tip at 1:00 PM PT and will be televised nationally by Fox Sports Net and webcast on www.sports.yahoo.com. USA Basketball Committee Chair, " Jrue Holiday and Jerime Anderson, for example, are guards the committee felt will be able to control the game and keep the pace in the USA's favor." 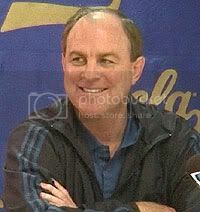 In a press conference on Wednesday UCLA Head Coach Ben Howland attempted to clarify reports and rumors of Bruin players leaving UCLA early for other pursuits. Howland stated freshman Kevin Love and junior Darren Collison have not yet decided whether they will make themselves available for the NBA draft despite numerous rumors. "It's an erroneous report," Howland said," Kevin left Wednesday afternoon to go home. He's going to sit with his parents over the weekend and try to formulate some decision as to what he wants to do." "I never met with Darren on Monday. I never spoke to Darren on Monday. I did not see him. I did not email him. I did not text him," Howland reiterated. Sophomore guard Russell Westbrook, who had a break-out season and impressed NBA scouts, is reportedly contemplating whether to enter the draft but he has not made a decision. However, Howland stated that if Westbrook returned next season that he'd be the team's starting point-guard. If both Collison and Westbrook leave this summer, it would leave Howland with inexperience at the point guard spot - perhaps the most important position in a Howland run-offense. College players have until April 27 to declare for the June draft. Two other Bruins, Josh Shipp and Luc Richard Mbah a Moute, may potentially test out their NBA stock this summer, but most likely they will both return next season. Both players are not expected to be first-round draft picks in this year's draft. Howland said junior forward Alfred Aboya, who is graduating with a degree from UCLA this June, is currently considering his options for next season. He may return to the team or he may focus entirely on his graduate school studies. Howland thinks Aboya will likely return next season. Some reports indicate sophomore forward Nikola Dragovic is considering a return to Serbia to play professionally rather than return to UCLA next season. "I think Dragovic wants to come back," Howland said. "My thing for him is to become more committed as a basketball player." UCLA has the top rated recruiting class arriving in Westwood next season in Jrue Holiday, Malcolm Lee, Jerime Anderson, and Drew Gooden. Coach Howland may still add to this class, however, his moves are complicated by the fact he is uncertain who is staying or leaving the team this summer. "It's too early to say how many guys we're going to have here next year from this current team," Howland said. "We'll see about Alfred, Josh and Luc. There's a good chance they could be here. There's also a chance they would go. So there is a lot of uncertainty, which doesn't make my job fun at this time of year."